The universe is massive and appears to contain infinite wonders. As our technologies become more advanced, we are poised to discover even more and perhaps prove our current theories wrong.Still, our observations and studies so far have revealed many strange phenomena in space. Surprisingly, one of the most complex objects in the universe is right here on Earth—and even closer than you probably imagined. 1. Galactic Years We all know that a year on Earth is 365 days, but there are also galactic years. For our entire solar system to make one orbit around the Milky Way, it would take 230 million years. This means that we will not make an entire orbit of the Milky Way in our lifetimes. The last time that our solar system completed its rotation, the human race was not even near existence yet. In fact, dinosaurs were still alive during that time. The next time that our solar system is in the same position in its orbit as today, human beings will probably not exist anymore.It is incredible to think about just how big our galaxy is. It is so small compared to the entire universe. Just think if the universe is infinite and our galaxy is also in a rotation around it, how long would the galaxy take to complete its orbit? 2. Earth’s Rotation In kindergarten, you learned that there are 24 hours in every day. If you really think about it, though, it is kind of unbelievable that every single day is exactly 24 hours, not one second more or one second less. However, Earth’s rotation slows down every century, which means that our days are not precisely 24 hours each. NASA has reported that the Earth’s rotation actually takes 24 hours and 2.5 milliseconds. Although 2.5 milliseconds may not seem like a big deal, Earth has been around for billions of years. If Earth’s rotation slows down every century, that time can really add up. For example, when the dinosaurs were around, days were only 23 hours long. If you thought each day goes by too fast now, just imagine what it would have been like a billion years ago. 3. A Cloud Of Alcohol For those of us who love to have a drink of alcohol, we can only imagine how great the world would be with clouds of alcohol floating around. In fact, this could be some people’s greatest fantasy.In the constellation Aquila, an actual cloud of ethyl alcohol exists. This is no ordinary cloud, though. Not only would this cloud be too big to fit on Earth, it would be too large to fit in our solar system.In diameter, this cloud is 1,000 times larger than our entire solar system. Unfortunately for those of us who would love to see and drink from this incredible phenomenon, this cloud is 10,000 light-years away. So unless space travel advances by an extreme degree, there is no getting to it in our lifetimes. 4. Burning Ice Although fire and ice are complete opposites, a huge exoplanet named Gliese 436b is covered in burning ice. This exoplanet is about 33 light-years away, yet it creates an unbelievable spectacle.Astronomers have theorized that the strange phenomenon of burning ice surrounding the exoplanet occurs due to an unknown state of water. This causes the surface of Gliese 436b to stay in a solid state of ice, even though the surface temperature of the exoplanet is about 439 degrees Celsius (822 °F). These factors interact to cause burning ice. 5. The Smells Of The Universe When we think about space, we imagine what we may see, feel, and even hear. But most of us have probably never thought about what we would smell in space. As no astronaut would be able to take off his spacesuit out there and live to talk about it, we can never know exactly what space smells like. But the odor from an astronaut’s gear after a space walk can give us some insight.Astronauts have said that their space suits smelled of hot metal and seared steak after a space walk. No one knows the true reason why that is so, but scientists believe that it may be traces of dying star odor. As if this was not strange enough, research by the Max Planck Institute found that the center of the Milky Way smells like raspberries. The cause is believed to be ethyl formate in the area, which is a chemical component of raspberries. 6. Earth As A Black Hole Whenever we think of black holes, we think of collapsed stars whose lives ended in supernovas so great that they created some of the most mysterious things in our universe. The creation of a black hole is a relatively rare phenomenon. Even our Sun could not create a black hole if it were to die right now.As we discuss Earth then, it is not logical that it could create a black hole, either. However, it is always fun to theorize about crazy phenomena that could occur in our universe.It has been hypothesized that if Earth were compressed to the size of a marble, it would collapse in on itself and create a black hole. This would occur because Earth would be so dense that it could create a black hole. 7. The Human Brain Even though we have been studying the universe for a long time, most of it is still a mystery to us. We have discovered many puzzling objects in our universe, but the most complex is still the human brain.The human brain has a billion neurons with a total of about 100 trillion nerve connections. It is so unbelievable to think about how small and complex a human brain is compared to what else we have discovered in our universe. Eventually, we may find more complex objects than our brains, but for now, we hold the title. 8. The Size Of Stars We all know that the Sun is huge and that it is so important to our world. Without the Sun, we would not be able to survive for long. Nevertheless, when most of us think of our solar system, we think of a much bigger area than the size of our Sun.This is a misconception, though. 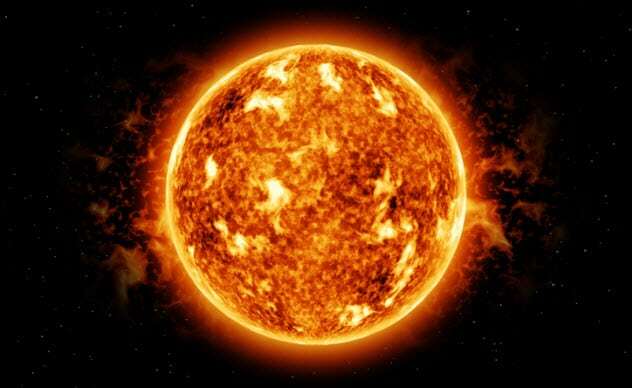 In fact, the Sun contains more than 99 percent of the mass of our solar system. Just think about how big the gas giants are, and the Sun still takes up the vast majority of our solar system. Approximately, one million Earths could fit inside our Sun. As if this was not incredible enough, just imagine the size of other stars. Compared to them, our Sun is fairly small. It just makes you think how unbelievably big stars can be and how much of our universe is taken up by them. 9. The Age Of The Universe Although it’s up for debate, the first human ancestor was thought to be alive around six million years ago. That seems like a very long time until we look at the age of the Earth and the universe. Then it seems like no time at all.Scientists have calculated that the Earth is about 4.5 billion years old. The first galaxies are believed to have begun to form about 13 billion years ago. Almost 14 billion years ago, scientists believe, the universe began to form. This is so incredible to think about. If a human lived to the old age of 100 years, that would be still be nothing compared to the age of the Earth, the solar systems, and the whole universe. 10. Unseen Objects We know that most of our universe has been unseen by the human eye or human-made devices. Scientists have used many electromagnetic wavelengths to try to see around our universe to places we could never get to in our lifetimes. They have used radio waves, infrared, and X-rays to make many discoveries. These wavelengths have also revealed great mysteries within our universe.Scientists have found that huge portions of our universe cannot be detected by any of these wavelengths. This could mean a lot of different phenomena are happening, but one theory is that dark matter actually exists. Dark matter does not absorb or emit light. However, even though we can’t directly observe dark matter, many scientists believe that we have strong evidence of its existence.